Thomas Gale is the Publisher of Modern Distribution Management and has owned the newsletter since 1993. For decades, Mr. Gale has researched and written on significant trends in independent distribution channels, including consolidation, integrated supply, e-commerce, vendor reduction, and shifts in value definitions. He is the co-author of Stand Out from the Competition! Four Pathways to Differentiate Your Wholesale Distribution Company and contributed to Outlook 2009: An Executive’s Companion to Facing the Forces of Change, both from NAW. He is a popular speaker on topics affecting independent distribution channels. Mr. Gale is also the President of Gale Media, Inc., which is the parent company of MDM and MDM Analytics. Mr. Gale can be reached at tom@mdm.com. 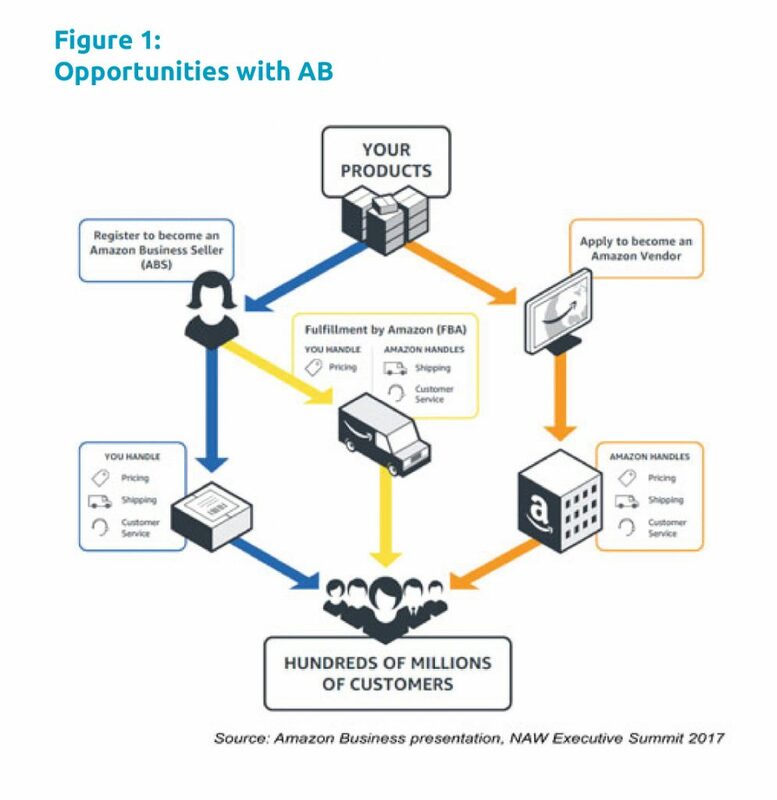 That was the question of the day at the National Association of Wholesaler-Distributors (NAW) 2017 Executive Summit in Washington, DC, where Rob Green, Director and General Manager of Amazon Business, tried to provide some answers in his presentation, “Amazon Business is Here, What Does That Mean for Distribution?,” to an attentive group of more than 350 distributors. But the audience conclusion was probably not what Amazon was hoping for. Amazon is best viewed as a foe with benefits, according to Julia Klein, CEO of CH Briggs, a specialty hardware distributor that serves the East Coast. Her conclusion—at least the foe part—was shared by every distributor in the room. When NAW Chairman-Elect Joe Nettemeyer of Valin Corp. asked the audience if they considered Amazon to be a friend, not a single hand went up. He noted that there was apparently no need to ask the second part of his informal survey question. The answer distributors are still waiting for is whether Amazon is a digital channel worth a shopping cart full of still-evolving and not-yet-defined potential threats to traditional channels of distribution. Until Amazon is able to communicate a clear win-win channel strategy to distributors, it will likely have a tough time gaining enthusiastic channel partners. The presentation provided some history on how Amazon Business fits into Amazon’s overall business plans and Green’s take on the future of the unit. Right now, Amazon Business appears to be experiencing strong growth, according to Green, with sales increases of 20% month over month. What it didn’t provide was the buy-in Amazon was looking for from those in the room as both a channel partner and supplier. 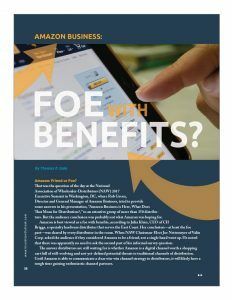 This issue of friend or foe represents an ongoing issue that has been part of Amazon’s bipolar courtship and competition with all sectors of distribution since it quietly launched AmazonSupply 5 years ago (something it had been building out for more than a decade). And the question was the first one raised in the Q&A session following Green’s presentation: If a distributor participates as a seller on Amazon Business, will Amazon mine its transaction and customer data to improve its ability to sell and compete against me with the same products? Green’s answer first discussed a firewall between the 2 sides of Amazon—its marketplace where distributors have their own digital identity and manage pricing, versus being a direct vendor to Amazon for its sales and pricing management—where data is not shared between the 2 sides of the business. But he then seemed to qualify that answer with a clarification about how data mining is a key way in which Amazon optimizes its selling process. He concluded by suggesting an offline conversation for more detail. Based on comments by distributors throughout the rest of the NAW conference, the conclusion of many in the room was that Amazon has still not settled on an inclusive channel strategy. It’s a question many distributors and manufacturers have had for 10 years after Amazon bought a small appliance parts online seller as a platform, then created AmazonSupply and transitioned that into Amazon Business in 2015. In the meantime, many distributors will reluctantly maintain an arms-length relationship and potential exposure of their customer analytics, but not raise a hand until it looks like Amazon clearly has the same intention. Green provided additional insight on the internal power structure at Amazon, citing a comment by Jeff Bezos in his letter to shareholders in 2015: “AWS, Marketplace, and Prime are all examples of bold bets at Amazon that worked, and we’re fortunate to have those 3 big pillars.” Green’s goal is to make Amazon Business the fourth pillar that Bezos wants to build the company on. But he acknowledged that the 3 current pillars still drive the company and its resources. This article originally appeared on mdm.com and is reprinted with permission from Modern Distribution Management/Gale Media, Inc. Material may not be reproduced in whole or in part without permission from MDM/Gale Media, Inc.